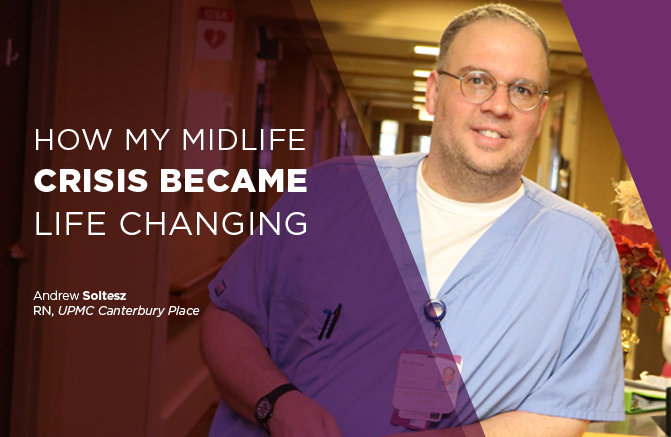 My name is Andrew Soltesz, and I am an RN at Canterbury Place, a UPMC Senior Living Community. I don’t exactly have the typical UPMC Careers story, but I’ll share a little about how I got here. Nursing was a midlife crisis career change for me; I went back to school for nursing shortly before I turned 40. After graduating from school, I started on a trauma unit at UPMC Presbyterian and worked there for a year and a half. Though I liked my role in the trauma unit, the work could be stressful at times, so I was looking for a change. As I was considering what was next, I knew that I liked working with the senior population, and I always thought about doing long-term care eventually. When a spot opened up at Canterbury Place, I felt that it could be the right fit for what I liked to do and what I was looking for. I really hit it off with Canterbury Place’s management and liked the feeling I got there, so when a team there offered me a job, I accepted, and here I am! My day-to-day in this role involves a lot of one-on-one care. One of my favorite things about this job is the opportunity to get to know my patients as I am providing care and administering treatments throughout the day. This role requires patience, and you have to really listen to the patients and pay attention to what they aren’t telling you as well as what they are telling you. Since I like to work with people and am a problem solver by nature, these tasks fit my skill set and temperament. Health care as a career gives me many opportunities to solve problems and help people along the way. Since I have been a patient in a hospital before, I know how it feels to be treated as a valued individual, and I also know how to feels to be treated as a task that needs to be done. That’s why, no matter how busy I am, I always try to give 100% of myself with every patient without seeming rushed (even if there’s lots to do!). I have been impressed from the start with how every team at Canterbury Place prioritizes the patients; they’ve set a great example for me as I settle into this role. From dietary to nursing to social work, everyone here is involved in the patients’ care and puts the patients’ well-being before all else. My coworkers are awesome! Above all, the most rewarding part of my job at Canterbury Place is when I feel like I am really able to make a difference in someone’s health outcome, or even just in their overall experience. Many nurses overlook the more psychological aspects of health care, but I find that getting to know my patients personally is not only better for them, but it also helps make my job more enjoyable. Not many people say they’re thankful for a midlife crisis, but I guess you could say I am. Without it, I wouldn’t be on this team getting to do work that makes a difference in the lives of others and provides perspective in my own life. I guess you could say my midlife crisis was life changing!